AC Issues - Compressor Clutch Always Spinning or hidden from view? I have a 2007 Toyota Yaris and live in Canada. With the warm weather finally returning I went to use my AC on the weekend and it only blew warm air. Today after work I tried it in the driveway and it started cold, but as soon as I took it for a drive it warmed up again. The car has not cooled down yet so I have not seen if it will consistently start cold and warm up or if this was a one-off event. I tried attaching a A/C Pro refill kit to it, but when I attached the pressure line to the low side (with Max AC on) the gauge was red. 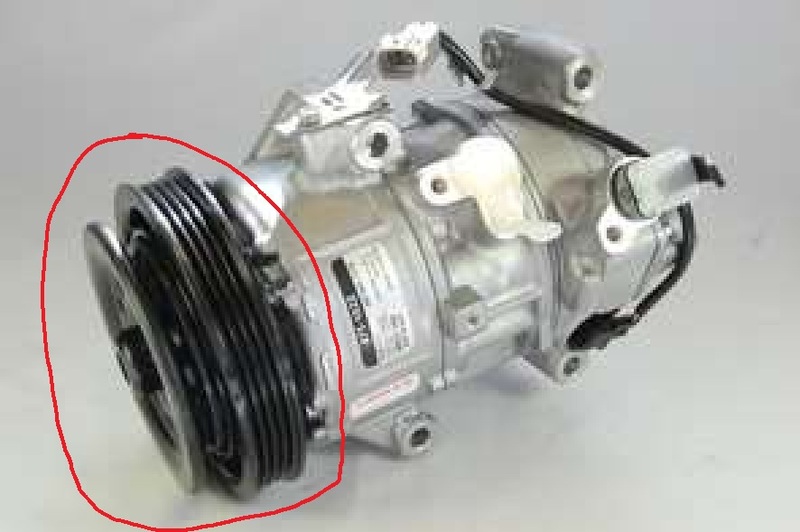 This indicates to me that the compressor is not engaging but when I look at it, the pulley is spinning and the wheel beside is also spinning (see image below). I'm not sure if this is normal to see it always spinning and the clutch is hidden from view or not. When I try spinning the wheel beside the pulley by hand with the engine off it does not budge. I have also tried disconnecting the connector at the front of the compressor with the engine running and set to max ac and it lowered the revs of the engine, and when I connected it back in the revs went up. that pulley will always spin, the a/c compressor is not a typical magnetic clutch where you can just look to see if it is engaging or not. I would get a manifold gauge set to see if you have any leaks anywhere. Thanks for that. That’s what I was thinking it was. I might ask around some guys at work about the gauge set to borrow one because for the price it may just be easier taking it into the shop lol. Proper gauge analysis is certainly a point to start with. There is no magnetic clutch but a solenoid valve in that compressor that may cause difficulties. The valve can be triggered also with original TechDoc software and cable. Cheap e-bay alternative also worked for me. You may also investigate the pressure sensor, it is easily accessible under the hood and it is a single sensor for both high and low pressures. It changes the resistance values based on the AC pressure. There is a thread here somewhere where I believe ctscott described how to bypass this sensor using two resistors. I had difficulties with that sensor, it gave some strange resistance spikes which confused the control unit and it disengaged the compressor to protect it from damage. I bought the sensor (original Denso) on ebay and got it replaced in the shop (there is a need to evacuate the AC system first). Running cool again.